HellermannTyton thermal transfer self-laminating labels are a conformable vinyl film with a white printable surface followed by a clear tail that laminates the printed text when applied to a wire or cable. The labels are UL recognized for indoor and outdoor use with an aggressive acrylic adhesive that allows the label to bond to large and small diameter wires. 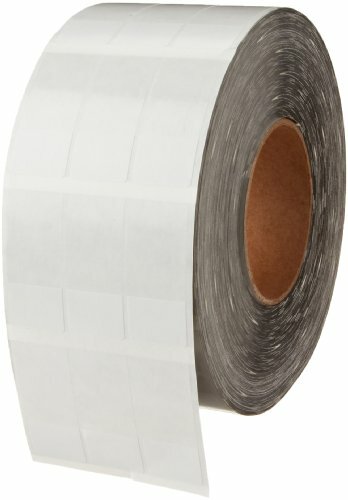 Thermal Transfer Self-Laminating Label, 1.0" X .75" X 2.25", 3 Across, Vinyl, White, 5000/RL. HellermannTyton Self-Laminating Labels come on rolls on a standard 3" core for easy loading into a printer or caddy. HellermannTyton thermal transfer labels work in any thermal transfer printer so that the use always has options to get labels printed without being locked into a single vendor. If you have any questions about this product by Hellermann Tyton, contact us by completing and submitting the form below. If you are looking for a specif part number, please include it with your message.